Heya, purdy people. I'm in the lab today, and I have a two hour break waiting for stuff to freeze. Instead of analyzing the giant number of images I've taken over the past week for my experiments, I'm going to just blog a lot instead because I'm at work on a Saturday and the images will still be there next week. Besides, the sooner I catch up on blogging the old crafting pictures I have stored on my computer, the sooner I'll get around to taking pictures of the things I've actually made in the last couple months and maybe this blog will be in real-ish time soon. 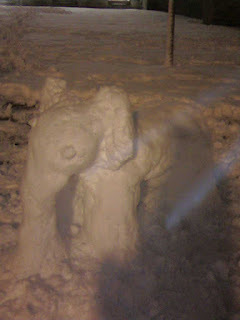 Boo yeah, I totally made a snow elephant that stands on its own. I wasn't the only one working on it - I believe Cheryl, Madison, Elizabeth, and Rae were working on it, too. Yay. This was senior year at Tufts, whose mascot is Jumbo the elephant. I find it amusing that I'm now in an SCA barony that has an elephant as a symbol, too, and my grandma collected elephants. 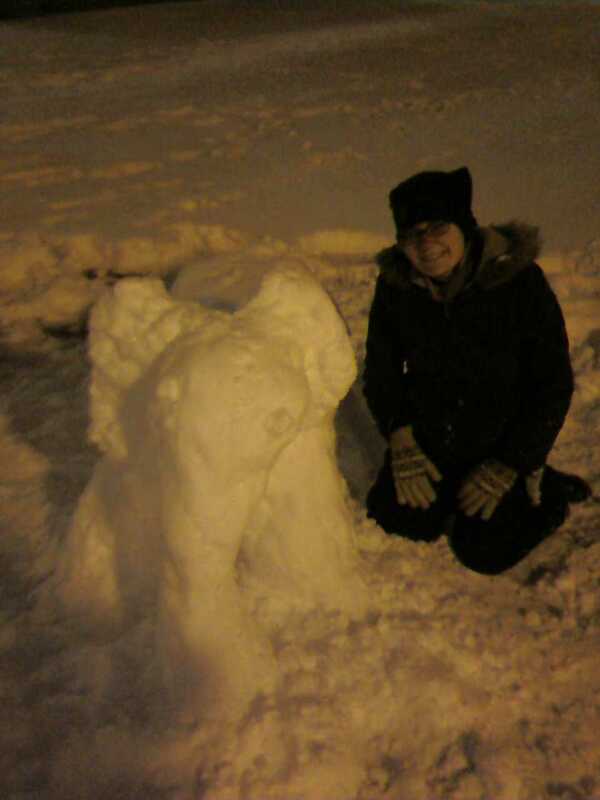 I just have an elephant-tastic life. 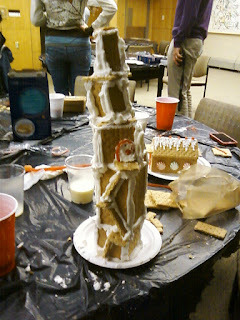 I went to two - yes, you read correctly, two - gingerbread-making parties this year! One was at Terryl's Christmas party, which was really nice because it was extended family/friends affair and helped make up for not having a Christmas party for my extended family this year. I made a tiny gingerbread village there, which I don't have photos of. My second party was with GradSWE (Society of Women Engineers), and was also a lot of fun. I was inspired by someone making a gingerbread tower at Terryl's party, and made a wizard's tower. 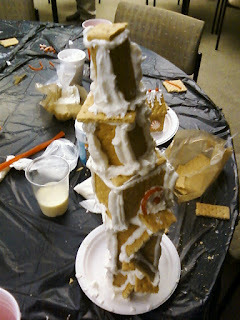 It is actually remarkably sturdy, as I was very patient and waiting between each layer for it to dry - it took me at least an hour to make this tower as I was socializing. I love how the door is on the third floor, haha.